Adder AdderLink X50 USB KVM Extender will transmit USB 2.0 with USB hub designed for use in applications where computers can have their USB 2.0 peripherals including keyboards and mice, high quality video and audio control extended up to 50m (150 ft.) across CAT5 or higher UTP cable. The AdderLink X50 provides sharp, bright and ultra high-resolution video over a VGA interface and ensures total USB compatibility regardless of the computer being controlled or the peripheral being extended. The 4-port transparent link supports most common USB devices such as mice, keyboards, touch screens, graphic tablets, jog shuttles, joysticks and mass storage devices. Isochronous devices such as web cams and headsets can also be used. The X50 kvm extension system supports Crisp, clear and industry leading video quality at very high resolutions of 1920x1200 Full HD 1080p, 1080i and 720p with distance up to 150 feet (50 meters). the ADDERLink X50 units can be mounted into a chassis (X-RMK-CHASSIS) that will allow 16 (X50) or 8 (X50-MS) units to be housed in 2U of rack space. Video Resolution 1920 x 1200 x 60Hz at distances up to 50m / 150 ft.
Devices Supported Supports all computers with USB style keyboards and mice, HDD15 video connectors and audio through 3.5 mm audio jack. Supports all USB devices. X50 is also known as X50-US and X50-USA. Question: Please assist me with details of a distributor closest to kimberley RSA. Answer: Thank you for your inquiry. For information regarding a local distributor, please contact Adder Technology directly at: http://www.adder.com/contact-form. Answer: Thank you for your inquiry. There are a number of extenders that will reach past 200 ft, depending on your requirements. 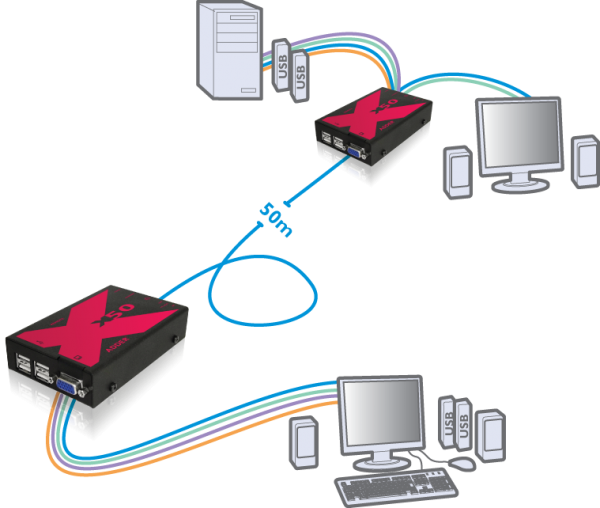 One option is the Adder X-USBPro (https://www.kvm-switches-online.com/x-usb-pro.html). It will reach out to 1000ft (depending on the cable used). For help selecting other extenders, please give your KVM Switches Online representative a call at 1-877-586-6654 or via our online chat feature to discuss your project in greater detail. Question: Will this allow me to conenct a USB keyboard, mouse, and joystick? Answer: Thank you for your inquiry. 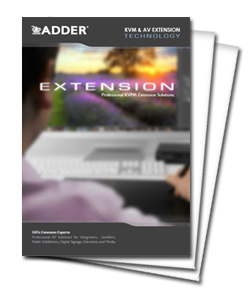 The Adder X50 will extend 4 USB 2.0 devices up to 50 meters away from you PC. As long as your device meets the USB 2.0 standard, there shouldn't be issues, however it is impossible to guarantee compatibility from device to device. If you would like a recommendation based on your application, please feel free to contact your KVM Switches Online sales representative.